Weather: Overcast skies with snow ranging from S-1 to S2 from 1pm to 430pm. Winds had already shifted to the NW by 1pm. Wind speeds were generally in the 10’s but some gusting reaching up to 30 at ridgetop at 11,500′. Precip fell as rimed particles and some graupel. Snowpack: New snow accumulations reached 5″ at 430pm. Just over 2″ fell between 1 and 430pm. 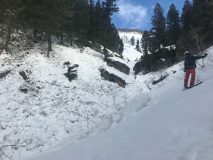 Poked around on a variety of aspects at ridgetop looking for fresh drifts with deepest being around 6 or 7″, Very minor cracking, 1 foot, on the driftiest features. All aspects, expect due north above 11,200ish” had a crust at new/old interface. Southerly aspects near treeline had crust 3″ thick underneath the new snow. 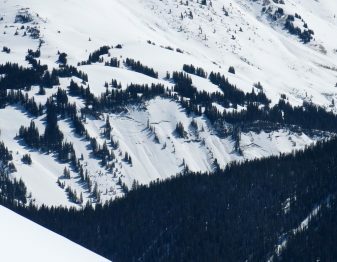 Steepest terrain features produced minor skier triggered sloughs. Free water on NE facing slopes had perculated down from 20 to 40cm from the surfaces. Most slopes above 11,000′ regardless of aspect had drained/froze any liquid water by the PM. Upper snowpack below around 11,000′ continued to hold moist snow below a very thin, weak crust from the previous night’s warm temperatures. 1 x loose wet pushed out on steep SE face in a radiator bowl feature. Skier on ridge punched into cornice on travers even being 12’ back from the edge. Weather: Mostly clear skies with West winds 15-20 mph, warm temps and strong solar. Snowpack: SE slopes at ridgetop became mount to wet in the recent new snow and could be pushed into D1 sized wet loose avalanche in some places. Low angle North had a firm crust NTL and BTL, but soft, punchy more of wind crust on steeper ATL. 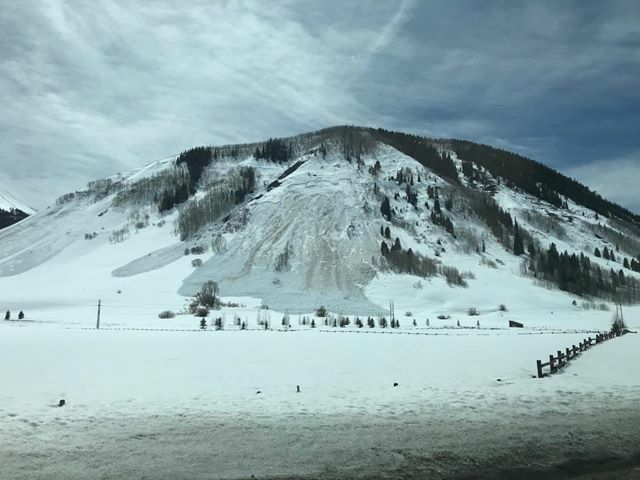 NE-N slopes at and above 12,000’ still held dry snow, but it is becoming affected by warm temperatures especially where protected from cooling winds. 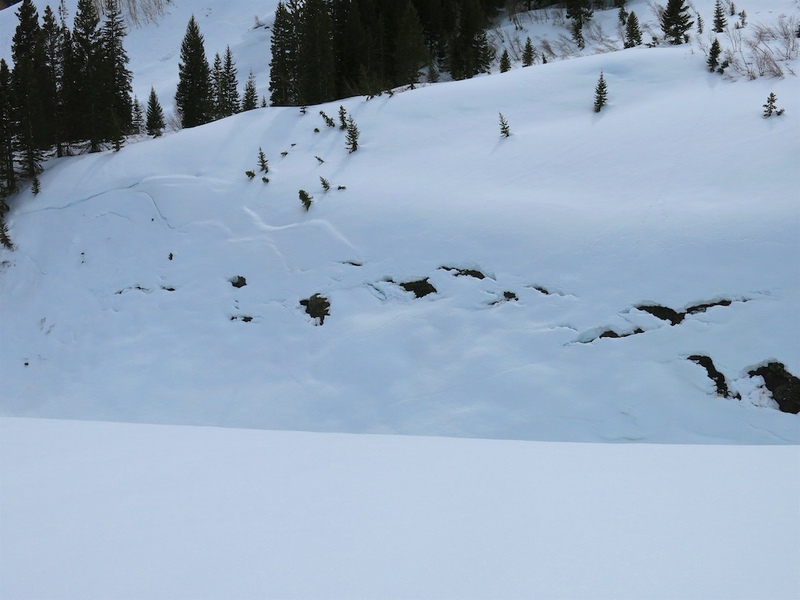 Snowpack: At 10,400′ HS: 241 cm. Free water was observed ~63 cm from the surface. This is ~38 cm above the 2/28 interface. Continued settlement from warm weather has consolidated the snowpack to nearly knife hard mid pack. Found an older wet slab on a SE facing slope around 9k. Probably slid the same day as the ones a little further up the valley in the first narrows. Weather: Partly cloudy this morning with enough solar on E-SE slopes to produce pinwheels in the upper 1″ of fresh snow around 9:30am. Intentionally skier triggered several wet loose slides on a S aspect of Axtell. D1, entraining only the new snow. 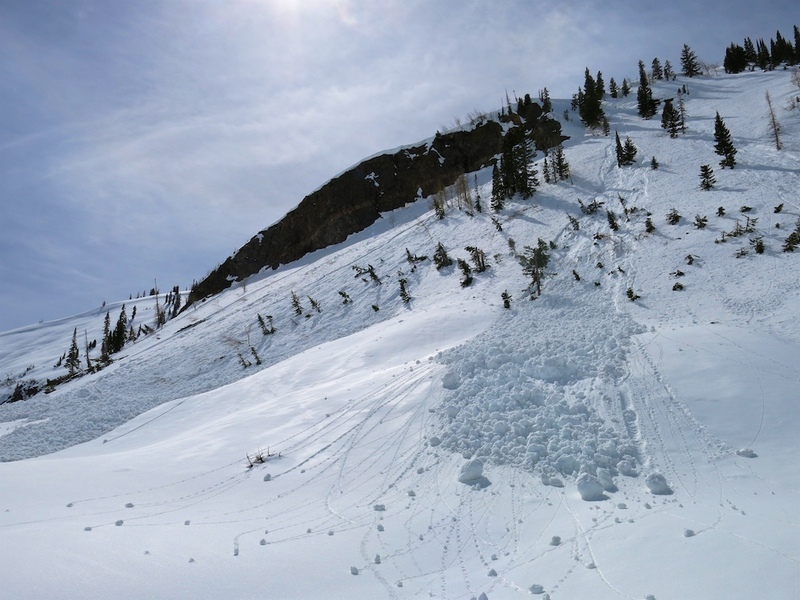 Also, saw evidence of the very large avalanches on W aspects of Whetstone and E aspects of Carbon [from March cycle]. E aspect of Carbon had snapped large aspens ~1/3 mile uphill on the opposite side of the valley. Carbon creek buried under substantial debris. Will email pics of Carbon and Whetstone slides because they’re cool! Weather: Broken skies moving to scattered around 1130. Light winds from the W, calm in the valleys. Snowpack: No signs of instability on W and NW aspects of Whetstone. 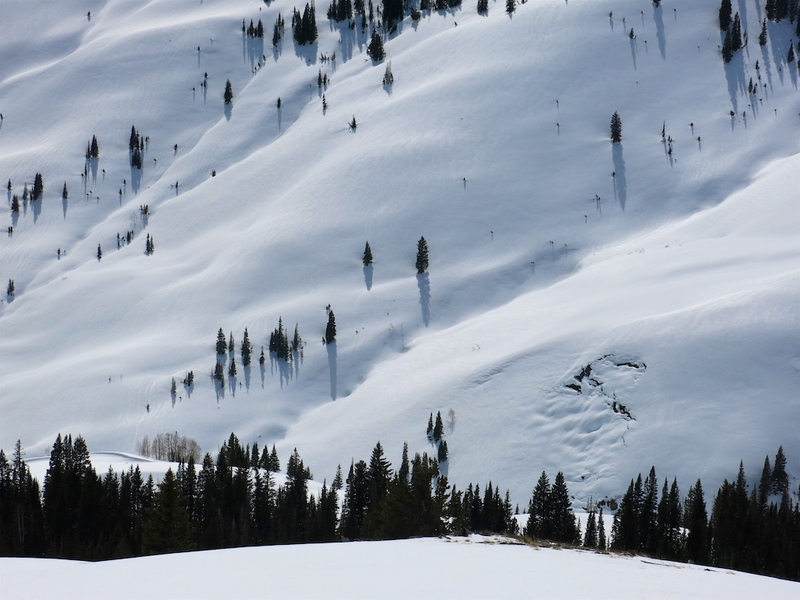 New snow was wet on S, SE, E aspects of Axtell, snow beneath MF crust was still dry. 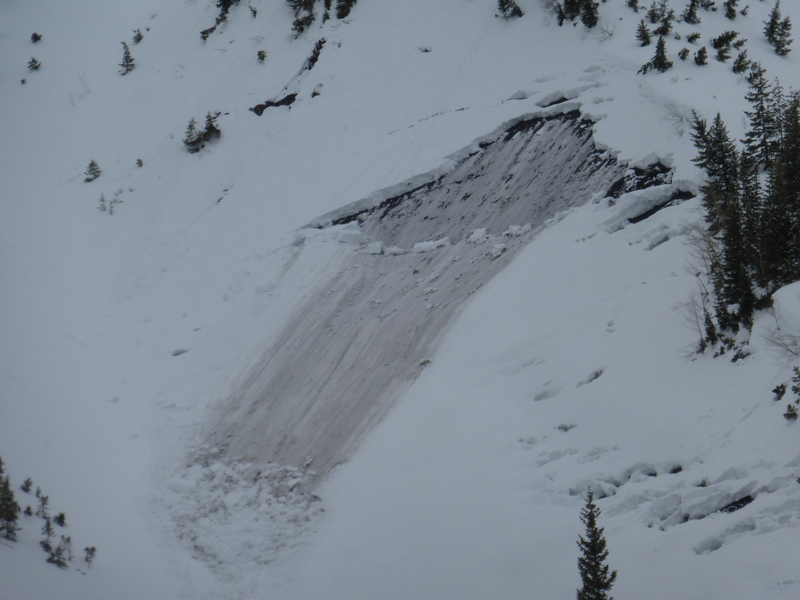 Observed two small collapses on small, isolated slopes, NE aspect of Carbon around 11,500′. These slopes were above and near areas that obviously slid during the March cycle, but were lower angle and had not slid. 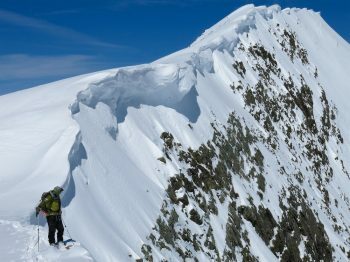 Skied a NE aspect on Carbon and saw no signs of windslabs on NE or E aspects ATL. Weather: Overcast skies with heavy snowfall at times, or none at times. Light winds from the West. Snowpack: New snow up to 4″ quickly consolidating on solar slopes with some radiation. 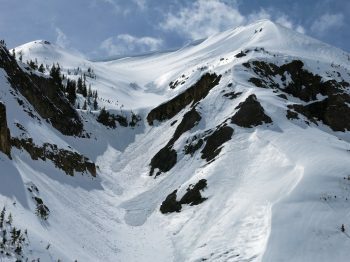 Very supportive snowpack and still soft, good skiing on shady slopes. 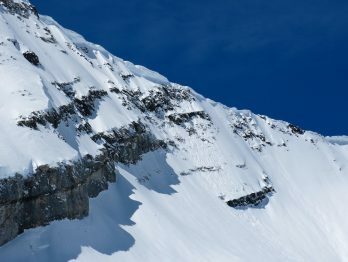 Southerly slopes had a 2″ crust below the new snow, though bonding seemed to be ok. Below the crust was weaker, faceted snow.